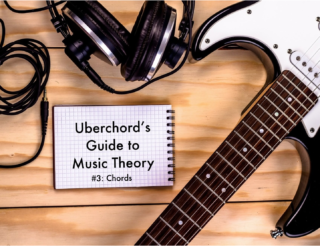 If you’ve missed our first three posts on “The Major Scale“, “Intervals“ and “Chords“ you will need that acquired knowledge to understand the material in this next lesson. It won’t take you long to get caught up. In this post you will learn everything you need to know about accidentals; these are sharps (#’s) and flats (b’s). 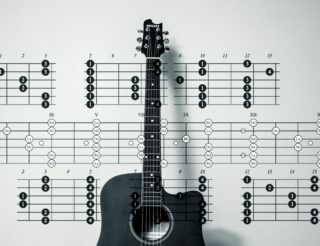 As a guitarist, why should I learn the circle of fifths? We’ll offer up 4 reasons! Why do we use accidentals? Which accidentals are associated with each key signature? Why do certain chords “belong together” and why do others not? You’ve seen them all over the place. An ‘Accidental’ is the official musical term for either a “sharp” (#) or a “flat” (bs). 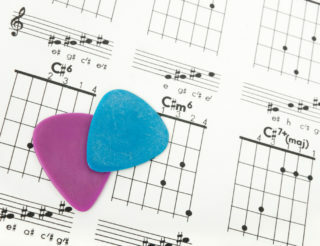 When placed in front of a note on a chord sheet, it either raises or lowers the pitch by a semi-tone. On guitar, this means moving up a fret for a # or down a fret for a b. Although this may seem trivial, the reason for using key signatures is a good one. If we have a song with C#’s (C sharps) and F#’s (F sharps) all the time and no natural C’s and F’s throughout it is easier to write and easier to read with a key signature rather than using the #’s every single time they appear. This is case in most pop and classical music. To really understand why we need accidentals in many situations we will use the piano keyboard a lot in this chapter. How Do I Know When to Use Sharps or Flats? To understand why we sometimes use ‘#’s and other times ‘b’s let’s take a look at treble clef notation. If we start a major scale on any other note than C and follow the major (Ionian) scale pattern (WT/WT/HT/WT/WT/WT/HT) we have to raise or lower some of the notes to fit this rule. 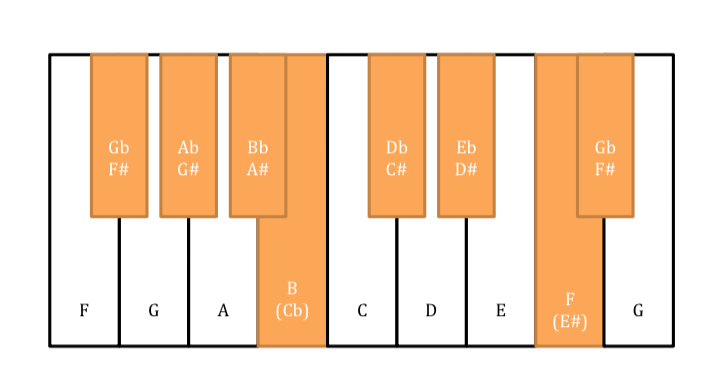 A scale starting with A will have the natural notes A, B, C, D, E, F, G. However, the half steps are in the wrong places for an Ionian scale [see image below: between notes 2 and 3 and betweens notes 5 and 6]. The natural notes have to stay where they are, but if we raise the C up to C# we get the half step where we need it, between notes 3 and 4. To make the other half step a whole step we raise the F to F#. After the F# we need another whole step so we also raise the G to G#, which then also gives us the required half step between notes 7 and 8. The resulting formula is: the key of A major has three #’s (sharps)! The notes C#, F# and G# are the black keys that we need for A major on a piano keyboard. Now here’s what A Major looks like if we write the scale using the key signature in Treble Clef. Starting the scale on F.
Natural notes: F, G, A, B, C, D, E.
There is one half step between notes 4 and 5 (which is wrong for Ionian) and one between notes 7 and 8 (which is right for Ionian). If we lower the B to Bb we have the half step where we need it, between notes 3 and 4. The key of F major has one b (flat). Never mix sharps and flats in the same key signature. It’s either one or the other. How do we know which Accidentals are in a Scale if it starts on a Black Key?! A valid question! The whole system of accidentals is organized around a wonderfully logical “Circle of Fifths” concept. In the circle of fifths, the notes of the chromatic scale are laid out economically, delineating vital information on the relationship between key signatures and their corresponding accidentals. The Circle of Fifths delineates vital information on the relationship between key signatures and their corresponding accidentals. The chart starts at ’12 o’clock’ at C, the only key signature to feature no accidentals. Moving clockwise around the circle of fifths means going up in fifths (hence the name), moving counter-clockwise means going down in fifths. Both directions meet at the very bottom at the most “opposite” key to C: Gb/F#, with a tritone distance to C. It has the most accidentals (6 b’s or 6 #’s) of any key which makes it somewhat unpopular to use. This is also the only key where you can choose between bs or #s.
With each fifth going down one flat (b) is added. Whenever a flat appears, it stays part of all the following keys. Think of it like collecting flats along the way. A new flat is always the fourth note of the corresponding major scale. With each fifth going up one sharp (#) is added. Whenever a sharp appears, it stays part of all the following keys. It is like collecting sharps along the way. A new sharp is always the seventh note of the corresponding major scale. All major keys that start with a black key (not a natural note) are keys using flats. The only exception to this is Gb, which can also be written as F#. If you have a keyboard lying around, try practicing these. It may take 20 minutes, but can save years of confusion in the end. There’s an important point when transferring this all to guitar. Having no ‘black keys’, the relationship of accidentals to key signatures becomes somewhat negligible. Another way to consolidate your understanding would be to try and write out all major scales in treble clef. 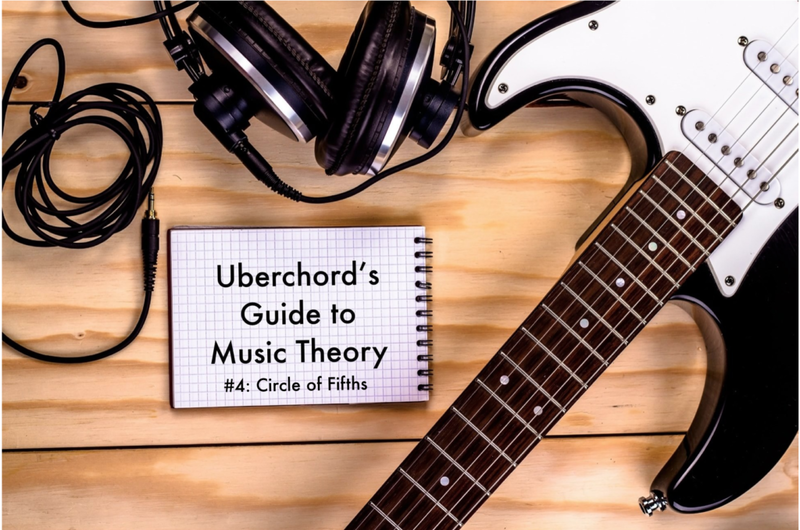 Here are practical situations where knowing the circle of fifths is helpful for guitarists. 1. Want to Find the Key to a Song? If there are any “black key” notes you can immediately eliminate certain key signatures in your head. For example, a G# or Ab: it can only be part of Eb, Ab, Db, Gb or A, E, B, F#. Incidentally, F# is the only key signature which can go by two names, depending on your purpose. 2. Want to Join a Band or Jam with Friends? Guitarists have the benefit of moving keys up and down on their fretboard. Piano and horn players have completely different shapes and patterns in each key. If you ever want to communicate with them efficiently you will need to know the keys, its accidentals and relative chords. 3. Want to be an advanced guitar player? Although on guitar you can move up and down the fretboard of course the key you are in makes a big difference when it comes to the use of open strings (which open strings are part of this chord?). Also where the bass note is located (E, A or D string? And which fret?) will immediately be clear for you and be related to the environment of a certain key. You will develop a coordination memory that works different for each key. Once you know them all, nothing can ever harm you anymore! 4. Want to Write Songs? Do you ever make up your own songs, melodies, lyrics? 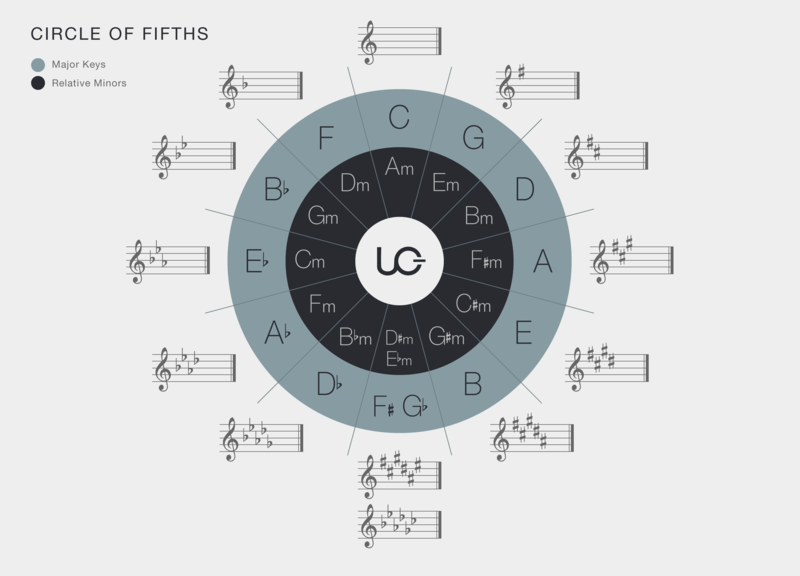 Knowing the Circle of Fifths and all the information that comes with it will be a great help to come up with chords or make something more interesting. If you cut slices of three neighboring chords with their parallel minor chords, you get “chord families” of six chords, that are close relatives and sound harmonious together. Gb and F# are objectively difficult to use, and almost always avoided in music. It is however, occasionally necessary to use them. To accommodate for the range of a singer for example, or if we move everything up a half step for a final ‘epic’ key-change. There is just one important thing to mention here. Regardless whether we choose Gb or F#, both contain a single accidental which lowers or raises a note to another “white key”. We hope this was somewhat revealing. Use this blog as a reference. Since this is about the universal system of all western music you can’t immediately keep all of it in mind. You will get used to it and find confirmation in all that you learned by playing. Brilliant post and it is so easy to understand. I have registered and now I can’t wait for the next lesson. 2. In the same section please include the note Fb in brackets next to E – just like Cb for B which you have already shown on piano keys. We will do the changes you mentioned and hope you will like future posts. If you were to name topics for them, what would they be?